I've seen lots of people recommend using black glue with watercolours recently so I thought we'd give it a try ourselves. The black glue is just PVA mixed with black paint (I used ready mixed poster paint). I did this when I didn't have much glue left in the bottle because I wanted it in a squeezy bottle so that I could pipe a design straight from the bottle. I just put some paint into the bottle with the glue and gave it a good shake. 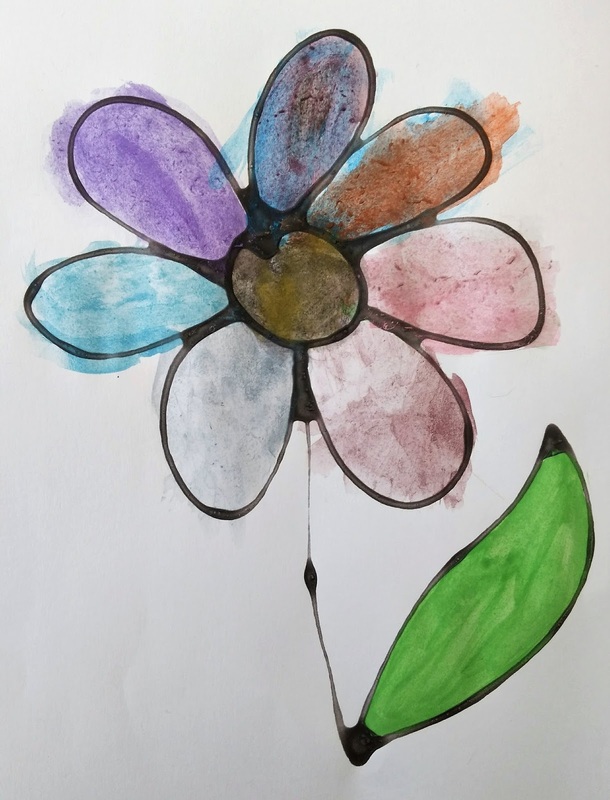 I drew a simple flower and left it to dry overnight before asking Jessica to paint it in the morning. The outline doesn't stay particularly raised so it's no help with learning to stay inside the lines but it does stay put and doesn't mix with the other paints. This could also be achieved by using black acrylic as I have done on the flower pots but I like this as an alternative too. Jessica must have enjoyed doing it too; as soon as she'd painted this one she asked me to draw her a cat in black glue for her to paint. What a surprise!